Couture Caddy | An Australian Fashion, Travel and Celebrity Blog: Sample Sale Alert! 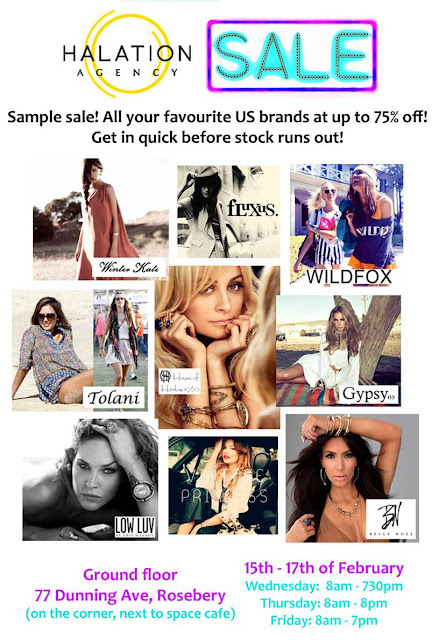 This is by far one of my favourite samples sales every year - hello how can you fault House of Harlow, Low Luv and Winter Kate at a fraction of the price! Plus they throw in some other fab labels like celebrity favourites Fluxus, Tolani, WILDFOX and Gypsy 05. I just fell in love with these labels when I saw their collections and of course all the celebrity loving. Be sure to get down to Halation Agency next week and check it out, for us bloggers its a fashion paradise! All of the outfits that you presented above are really chic and I could see my self wearing all of them :).